‘they have already drawn together into one Room, the greatest part of all the several kinds of things, that are scatter’d throughout the Universe’. This was a bold claim for a collection kept in the Society’s modest quarters at Gresham College in the middle of London, but it reflected the early Fellows’ ambitions and their belief that anything was possible with the help of a large group of like-minded individuals. They called their collection the ‘Repository’, and Hooke, as their paid curator, was nominally in charge of keeping the Repository in order. All sorts of people contributed all sorts of things to the Repository. John Wilkins FRS produced ‘the skin of a monstrous lamb . . . having seven legs, two bodies, two tails, and only one head’. One Mr. May sent in ‘the skin of an antilope, which had died in St. James’s Park’. And Mr Henry Howard presented ‘an excellent mummy’. In 1666, with the help of a donation from their treasurer Daniel Colwall, the Society bought a large collection of ‘natural rarities’ which had been on public display in London near St Paul’s. This rather random assembly of curiosities included a ‘Gyants Thighbone 4 foot long’ – but the Fellows were probably more interested in items such as armadillos, crocodiles, chameleons, humming-birds and tropical shells. One of the reasons for having this kind of collection was to allow comparisons to be made between specimens, in a first attempt towards a universal classification system. In some ways the natural world was like a giant jigsaw-puzzle, and the Fellows thought that if they collected enough pieces they would be able to put together an accurate picture of how things related to other things. Various attempts at a catalogue were made, but it was not until the late 1670s that the current Secretary, Nehemiah Grew, began to make progress. 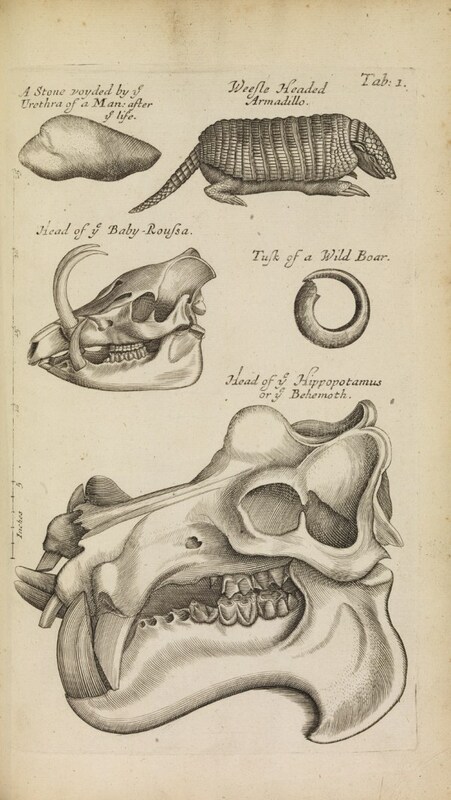 The book was finally printed in 1681 with the title Musaeum Regalis Societatis; or a Catalogue & Description of the Natural and Artificial Rarities belonging to the Royal Society and preserved at Gresham College. Grew stated his intentions in his preface – unlike previous catalogues of Renaissance noblemen’s ‘cabinets of curiosities’, his descriptions would not emphasise exotic and monstrous specimens, and would avoid repeating spurious information culled from earlier writers. The catalogue would be written on philosophical principles, with the aim of re-creating the collection in print for those unable to visit in person. Well said, that man! Grew’s meaning is clear, but why he would choose to strike a blow for equality of the sexes here is unknown to me (unless his wife had been reading the draft text and demanded some kind of explanation). The Musaeum is not as lavishly illustrated as Micrographia, or some of the other Royal Society-sponsored books of the period, but there are some very nice engravings of particular specimens, such as this ‘weesel-headed armadillo’ (a name invented by Grew), hippopotamus (‘or behemoth’), and kidney or bladder stone. As with any printed catalogue, it combined scholarship with self-promotion – in this case on the part of the Royal Society, who had formed the collection. Sadly the Repository is no longer with us, and we’re only able to identify a very few items from it. It fell into disrepair in the early 18th century, and a German visitor to the Royal Society in 1710 rather sniffily recorded that most of the artefacts were lying neglected, broken and covered in dust. (He was all the more disappointed because he had admired Grew’s catalogue and expected great things of the collection.) By this time it had become clear that the early hopes of making a complete collection of natural history were in vain, and the focus of research had moved to other areas. But perhaps the most important function of the Repository was to prompt other Fellows to assemble collections of their own – including Sir Hans Sloane, whose massive hoard of books, manuscripts, ethnographic items and natural artefacts were bought by the nation at his death and became the nucleus of the British Museum. And the giant’s thigh-bone? Grew re-identified this in his catalogue as the ‘leg bone of an elephant’. Perhaps it’s still lying somewhere in the Natural History Museum’s storerooms today. If you’d like to look at Grew’s Musaeum, there is a scanned version on Google books. And for an excellent scholarly introduction, see Michael Hunter’s essay ‘Between Cabinet of Curiosities and Research Collection: The History of the Royal Society’s “Repository”‘, in Establishing the New Science: the Experience of the Early Royal Society (Boydell, 1989). This entry was posted in Restoration Reading and tagged books, hippopotamus, Nehemiah Grew, repository, skeleton by felicityhen. Bookmark the permalink.